This was followed by a series of forced, but funny comedic moments as the actors played like siblings. Hader and Neff even tussled around a little. Lasseter showed a scene from the film – likely the beginning – that depicted a bunch of asteroids floating beyond Earth, seeming like they would crash onto the planet. But they don’t. They pass right by as the dinosaurs gaze into the sky. Co-director Peter Sohn and producer Denise Ream discussed the feature, sharing concept art of the featured dinosaurs. Each species acts like a different type of farm equipment, they described, in this self-managed environment. The two showed a few scenes of the film, including those dinosaurs farming the land, like how the Apatosaurus farms by digging their heads into the ground, for instance. A beautiful systematic score complemented the scene. Sohn and Ream also shared animation tests of baby versions of dinosaurs. Humans also factor into this dinosaur world, as evidenced by a little boy named Spot, who befriends Arlo, despite him being somewhat rough on the heartwarming dinosaur. Together the pair are thrust onto a “dangerous spectacular journey together.” The clips of The Good Dinosaur make it look like a truly hilarious and majestic movie, one that should not be missed when it premieres in May 30, 2014. Stay posted on new D23 Expo updates by following @bnachmanreports and @geeksofdoom on Twitter. 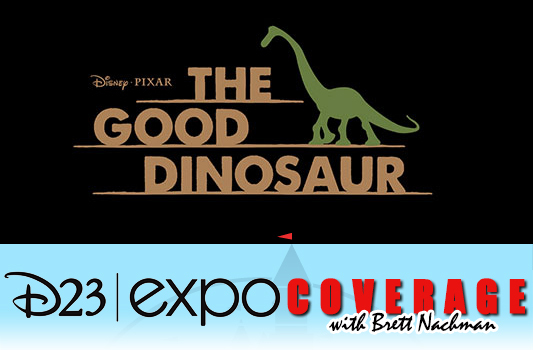 And check back here at Geeks of Doom for more news from me on the D23 Expo!